The ease. The older your home siding is, the more maintenance it needs to stay clean and attractive. Replacing your siding gives you sturdier, less weather-worn siding. 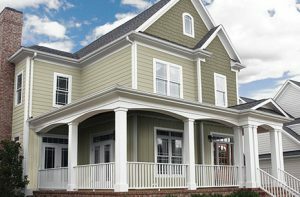 Your home will also gain the benefits of the technological advancements building materials have made since your home’s original siding was installed. We’ve come a long way from the cheap vinyl sidings of the past. Today’s selections look just like wood, but with added longevity and less maintenance. The style. Did you know that curb appeal can increase your home’s value by up to 10 percent? That means more than just keeping things clean and pressure washed. Replace your outdated home siding with something smooth, elegant, and timeless. The structure. Vinyl siding is about more than just looks. It protects your home from exterior damage from the sun and storms, helping to prevent structural damage due to rot, mold, or pest infestations. And a solid house is something worth investing in! The savings. The benefits of an energy-efficient home are numerous, and they’re not all outside of your front door. Installing energy-efficient windows and home siding can reduce home heating and cooling costs, resulting in a lower energy bill each month. Vinyl is also an eco-friendly material that doesn’t negatively impact the environment. Want to Learn More about New Vinyl Siding? Schedule a Free 60-Minute Consultation?